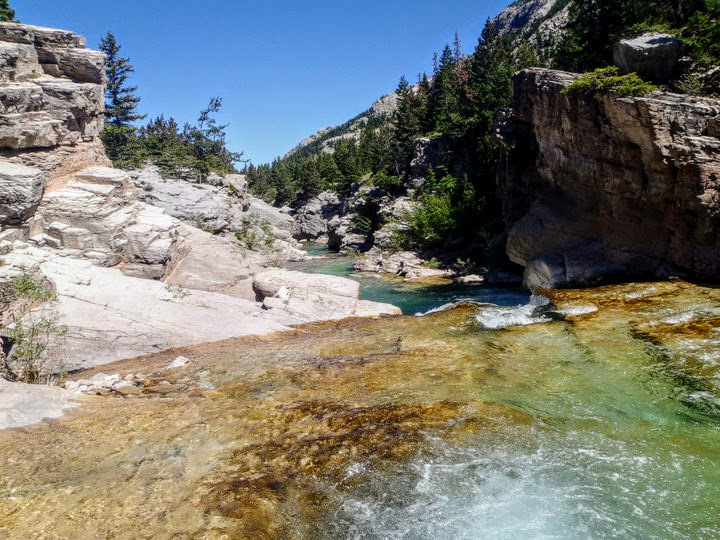 ‘The Bob’, a Congressionally designated wilderness area, is easily accessed one hour west of Great Falls, Montana. The Bob Marshall Wilderness extends for 60 miles (97 km) along the Continental Divide and is the 5th-largest wilderness complex in the lower 48 states. There are many trails in the Bob Marshall Wilderness Complex within minutes of Great Falls. Steamboat Mountain is an easy day hike. Head East from Great Falls Montana, past Bean Lake, to Dearborn Canyon Road, where you will find the parking area for the trailhead. This trip is best planned using the Bob Marshall, Great Bear, Scapegoat Wilderness Map from the US Forest Service. Ranging in altitudes of 4,000 to 9,000 feet (1,219 to 2,743 meters), the highpoint of the Bob is the Chinese wall, an escarpment that averages 1,000 feet (305 meters) from its base and extends for 22 miles (35 km). With waterfalls, lakes, and dense forests, the Bob is prime Grizzly bear habitat. All this makes the Bob a great spot to hike and enjoy the splendor that is classic Montana. Motorized vehicles are not allowed, so you can enjoy the serenity of the great outdoors in solitude. Fishing is allowed with a state license. Wilderness areas in the Bob allow in-season hunting with a permit.